Peter Crowley was the unlikely hero for Kerry with the corner back as he fisted over a 74th-minute winner to maintain the Kingdom's perfect record in the league and consign Dublin to a second loss in three games at a packed and partisan Austin Stack Park. Just under 12,000 were in Tralee to see the league champions beaten by their old nemesis who were earning just their fourth League win in 11 meetings over Dublin this decade, and just like the drawn game in Tralee two years ago this contest didn't lack for pace or passion either. 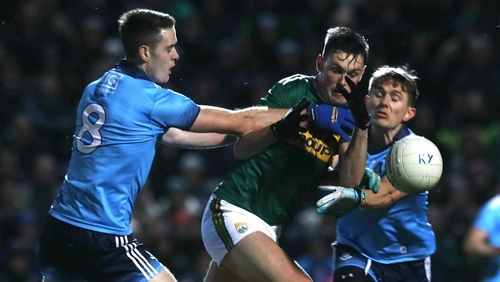 Kerry led by five points after 42 minutes, and backed by the majority of the 11,982 partisan crowd, they were in pole position to earn the victory but Dublin kept their best football for the last quarter as the League champions went about reeling their opponents in. Even the loss of Mick Fitzsimons to a second yellow card after 60 minutes barely derailed Dublin in that last 15 minutes, although in hindsight they could argue the absence of the Cuala man left them sparse at the back as Kerry pressed for that winner in additional time. It was helter-skelter stuff from the first whistle in a persistent rain with Kerry showing early intent with full back Jack Sherwood getting forward for the first score inside two minutes and the high tempo never relented. An early Dean Rock free settled the visitors but Kerry kept the accelerator down and led by two points on three occasions by the 20th minute only for Dublin to half the deficit each time. Kerry's response to that third time was a Stephen O'Brien goal to make it 1-6 to 0-5 but the Kerry supporters had barely taken their seats when Con O'Callaghan sailed through and slipped a low shot, with the help of a deflection, past Shane Ryan to make it a one-point game again. Kerry responded with four unanswered points from Tom O'Sullivan, Dara Moynihan and two Sean O'Shea frees but Dublin struck back with a Paul Mannion goal to help make it 1-11 to 2-6 in Kerry's favour at the break. Points from James McCarthy, Mannion and Dean Rock with his fifth of the night cut the gap to two points before Dublin were reduced to 14 with Fitzsimons' red card, which brought the best out of the Dublin with points from Brian Fenton, Mannion and two from Cormac Costello leveling it at 1-17 to 2-14 before Crowley fisted the winner to keep Kerry on maximum points from three games. Kerry: Shane Ryan, Peter Crowley 0-01, Jack Sherwood 0-01, Brian Ó Beaglaíoch, Tadhg Morley, Paul Murphy, Tom O’Sullivan 0-01, Jack Barry, Adrian Spillane, Diarmuid O’Connor, Sean O’Shea 0-08 (0-07f, 0-01 '45'), Dara Moynihan 0-02, Paul Geaney 0-02, Gavin O'Brien 0-01, Stephen O’Brien 1-01. Dublin: Evan Comerford, Michael Fitzsimons, Eoin Murchan, John Small, Eric Lowndes, Jonny Cooper, James McCarthy 0-03, Brian Fenton 0-01, Darren Gavin 0-01, Brian Howard, Con O'Callaghan 1-00, Niall Scully, Dean Rock 0-05 (0-04f), Cormac Costello 0-02 (0-01f), Paul Mannion 1-02 (0-01f).